At the upcoming InfoComm Convention, scheduled for June 9-15, at the Las Vegas Convention Center, Grass Valley will exhibit its latest high-definition (HD) video and audio editing, as well as digital video recording and management solutions. The products will be on display in the Starin Marketing booth (#C6023) and are targeted at helping audiovisual (A/V) producers cost-effectively implement streamlined workflows for the creation and presentation of all types of sophisticated multimedia projects and multi-camera live events. Among a number of live product demonstrations, Starin Marketing will feature Grass Valley EDIUS 6.5 multiformat nonlinear video editing software and the Grass Valley ADVC-G Series of multi-purpose digital video converters being used to create audio and video clips. These clips will then be stored and distributed (or displayed) via a Grass Valley T2 intelligent digital disk recorder (iDDR). Due to its advanced codec, multiformat file support, and unparalleled speed, EDIUS is becoming one of the dominant solutions among editors working in the professional AV industry. 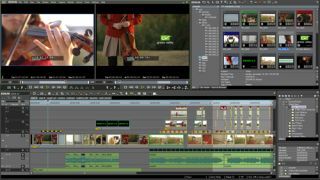 At InfoComm 2012, Grass Valley will demonstrate the software’s comprehensive 3D editing workflow and 4K production with native support for raw footage captured with digital cinematography cameras from RED Digital. The Grass Valley ADVC-G Series of signal converters offer support for “any signal-in, any signal-out” full bandwidth conversions in small foot-print “brick-style” form factors. Several new options for the T2 iDDR will also be shown at InfoComm, including an improved user experience—based on improved processing speed and several new keyboard shortcuts—and a new QoS feature that streamlines clip record and playback capabilities. In addition, there is new optional support for content stored on P2 solid-state cards and XDCAM optical disc media. With these additional options, users of the T2 iDDR can now play back HD clips compressed with both codecs (AVC-Intra/DVCPRO and MPEG-2 4:2:2, respectively) without the need for time-consuming transcoding. The new Alpha option for the T2 iDDR lets users separate the alpha channel from the source and set key and fill on two fully synchronized channels for simultaneous playback on multiple display screens.